Understanding that everything in nature moves in a cyclical manner is vital to comprehending the world around us. This is how energy moves. The waves in the ocean give the impression the water is moving when in fact if you throw a bottle that floats into the water you will notice that the bottle rises and falls but does not move with the waves that pass below. WHY? Because the wave is just energy moving THROUGH the water, not the water itself moving. Water movement is the current that takes place separate and distinct from the wave movement. Once you wake up and begin to see that energy moves THROUGH the medium be it space, the air, or crowds of people causing collective behavior we call panic, then you can begin to see the world in a whole new light. This fall, we will see more chaos in weather. We are headed into a period of wild weather that will be marked by extreme swings in both directions. The deadliest tornado was the Tri-State Tornado of March 18, 1925 that killed the most and the most destruction was the St. Louis-East St. Louis Tornado of May 27, 1896. The recent outbreak of tornadoes from a cyclical perspective is a bull market. We are building in intensity that many have tried to usurp calling it global warming claiming man has caused this. 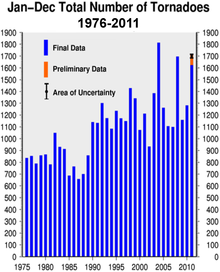 The data shows before automobiles there were cyclical weather patterns that we have not yet reached – but will insofar as intensity. Our correlation models indicate that whenever we get a cold spring then we move to a violent storm like hurricanes in the fall. It is like a pendulum. The more you swing to the extreme on one side the more you will move to the extreme in the opposite side. Markets function in the same identical manner. 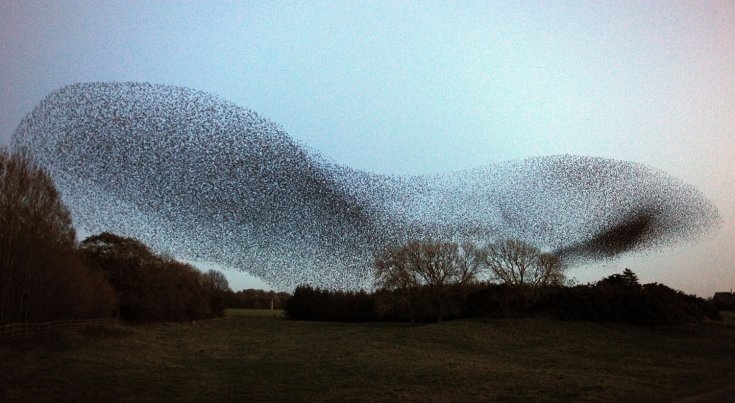 Here is a photo of starlings flying. Not only do they comply with the cyclical movement patterns, but the group is neatly formed that even complies with the science of chaos. Look at this illustration of the Chaos formation of weather data. There are boundaries that confine all movement at the extremes. Chaos was discovered by weather. What on the surface appeared to be random, actually contained hidden order. Edward Norton Lorenz (1917–2008) was an American mathematician and meteorologist, and a pioneer of chaos theory. He discovered the strange attractor notion and coined the term butterfly effect. His strange attractor illustrated that within what appeared to be random chaos, there was actually incredible hidden order. His discovery has illustrated that predicting the future is highly complicated because (1) we are dealing with a massive amount of variables not a single cause and effect, and (2) this complexity constitutes a nonlinear system that produces the unpredictability yet within defined outer parameters. Within any data series if we are talking about weather or markets, to the uninitiated observer who does not see patterns in charts like the the movement of starlings, they only see trajectories that appear to jump around making hair-pin turns and reversing direction only to swing back and re-reverse without warning. This is the majority who buy or sell because the group in doing so and feel comfort in collective reinforcement. Nevertheless, their chaotic random appearance of weather or markets with respect to the behavior is like Lorenz’s strange attractor always orbiting within the shape of the system in a orderly manner confined by the outer-boundaries. The strange attractor is the actual map of all the possible states within the system yet conform to the fascinating shape defined by those outer-boundary limitations on all movement. The entire economy is still a non-linear system that on the surface is massively unpredictable from moment to moment, yet is strangely bound within predetermined confines. This is why I state that you CANNOT predict gold or any market in isolation. Everything is connected and there is a form to this madness. Every price movement, no matter how alarming in its twists and turns, always collapses and then recovers. This is the energy that creates everything around us – the swings between two extremes like the beating of your heart. Even our economies are a complex system that cannot be manipulated by government and it is why Marxism/Keynesianism have utterly failed. The bureaucrats and the bankers hate my guts because I stand to expose what they do is only aggravating the system and is causing us to move to the extremes of the outer-boundaries on each side. This leads them to seize even more power to put their hands around the neck of the economy and choke it to death so they can retain power. The more they react in this manner, the greater the volatility causing them to chase it even more until they become their own worst enemy. That is why I say big governments always fall by their own hand – it is economic suicide. They become more draconian the more they lose power. This is the fate of all empires, nations, and city-states. They cannot see that their greatest enemy is always themselves. 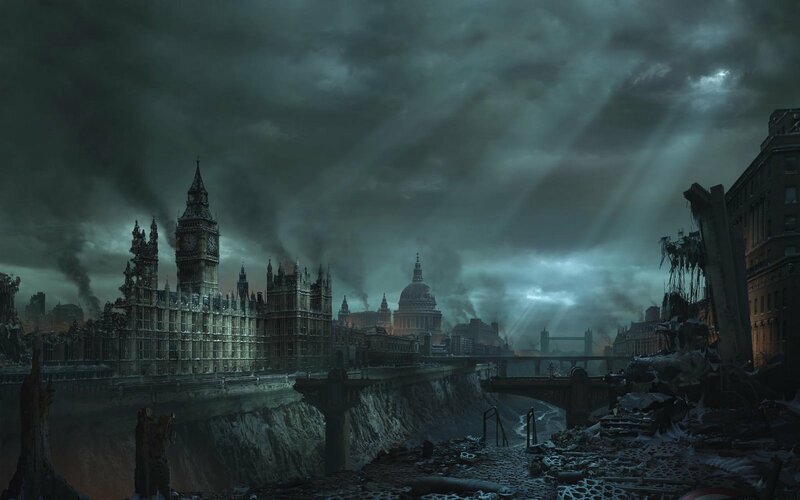 The politicians would rather destroy centuries of civilization before rationally ending socialism that does not work. The banks want to be the man with the one-eye in the land of the blind. But rigging the game to create the perfect trade, only results in destroying society. They may become the one-eyed man in the land of the blind counting all their wealth, but there will be nothing left and no place to spend it. At that moment in time, historically even gold has lost all value as was the case after the fall of Rome. Even Paul Volcker in his Rediscovery of the Business Cycle conceded that the idea that government could manage the economy under this age of “New Economics” failed. Nobody in government is willing to hand back power once taken. It is like the conviction rate in New York City – 99%. Citizens cannot ever win anything against the banks of government. Politicians will NEVER admit they are the source of the problem. So it looks like we must simply crash and burn.